In recent years thin film coatings of transition metal nitrides have received considerable interest due to their high hardness and toughness. There are a huge range of Surface coatings available for many different industrial applications. TiN and CrN will be selected for erosion resistant coatings due to their high hardness, good corrosion and oxidation resistance, and the relative ease in which they will be deposited as both monolayer and multilayer coatings using advanced cathodic arc deposition. The success of these coating will depend upon the increase in the life time of the coated industrial tools. These films were deposited in the form of monolayer and nano-structured multilayers using advance cathodic arc process to produce coatings that can have flexibility to modify the surface properties as per the need of application. Two types of coating structures viz CrN-Cr and TiN-CrN were fabricated for the evaluation. 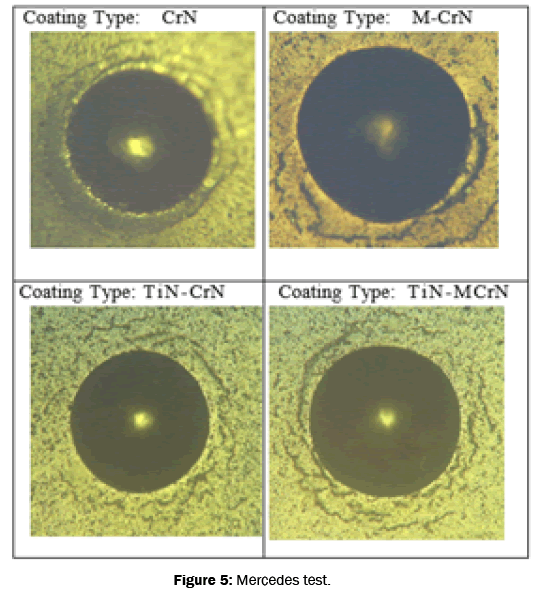 CrN-Cr is the Hard and Soft layer combination whereas TiNCrN is the Hard and hard coating combination. These structures have been compared with mono-layers of CrN and TiN. The investigation includes micro hardness, roughness test Corrosion Rate Measurement (potentiostat) and wear coefficient. Coating thickness measured with Calo-test (Ball crater) instrument, Mercedes test using Rockwell C instrument, and the structures of coatings were investigated using the SEM. The XRD analysis was carried out to specify the phase structure. As compare to Hard and Soft layer combination, Hard and Hard layer combination shows improved tribological properties. Advanced cathodic arc deposition; Nano-structured multilayers; Hard and soft layer; Hard and hard coating; Industrial tools. Recently, the tribological performance of CrN coating has been demonstrated a good protective coating candidate due to its high hardness , good thermal conductivity and chemical stability . Nowadays fabrication technologies require tools to have improved reliability, durability  aesthetic appearance/decorative applications and long-life operation which greatly depends on their tribological and corrosion properties . These include hard and wear resistant nitrides coatings of Ti and/or Cr on tools and automotive components . In present study, coatings were produced by advanced cathodic arc deposition (ACAD) this process is one of the most suitable due to high deposition rate during growth . In the current investigation an advance cathodic Arc system were used to deposit mono-layer and multilayer coatings on Oil Hardened Non-shrinking Steel (OHNS) and mirror polished stainless steel (SS 316-L) coupons having dimension 50 mm diameter (ϕ) and 8 mm thick. These samples were thoroughly cleaned using ultrasonic bath having organic solvents followed by degreaser to remove surface contaminations. The roughness of these coupons was maintained at 0.024 micron. Cleaned samples were deposited with TiN, CrN monolayers, CrN/Cr Multilayers and TiN/CrN bi-layer, TiN/M-CrN under ultra-high vacuum condition in ACAD equipment. UHP nitrogen gas and 99.97% pure Ti and Cr targets were used during deposition. Various characterization tools such as, Calo wear, SEM, Surface roughness were used to evaluate the tribological properties of these coatings. Surface roughness analysis of TiN, CrN, MCrN, TiN/CrN and TiN/MCrN thin films shows a radical reduction in the density as well as size of micro particles. SEM photographs (Figures 1 and 2) shows clear evidence of the same which is further complimented by the Ra value analysis (Figures 3 and 4). Coating adhesion is also estimated by Mercedes test to confirm the adequate adhesion straight between substrate and thin films (Figure 5). Figure 3: Ra value analysis. 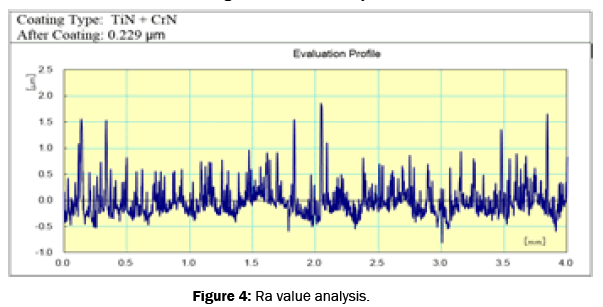 Figure 4: Ra value analysis. Calo-wear test (Figure 6) has been carried out to evaluate the coating thickness as well as wear rate of these coating combinations. A soft stainless steel base coated with hard coting (TiN, CrN, M-CrN) shows higher wear rate as compared to a Bi-layer system consist of stainless steel base with Hard coating (TiN) and other Hard Coating (CrN, M-CrN). 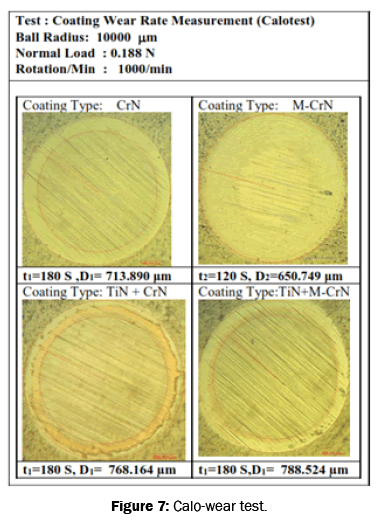 MCrN coating shows less wear rate as compared to CrN or TiN whereas TiN+M-CrN shows further reduction in the wear rate (Figure 7). 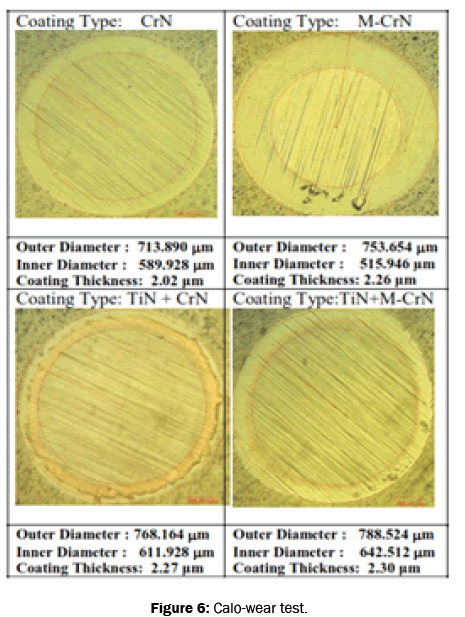 The Coating Wear Measurement is done by Calotest with the load of 0.188 N as shown in the Table 1. Table 1: The Coating Wear Measurement is done by Calotest with the load of 0.188 N.
These results clearly show that as the base hardness is improving wear rate also tend to reduce. Coating Surface roughness also contributes to this reduction in wear rate. Hard-Hard coating combination revel improved wear resistance as compare to Soft- Hard coating combination. In our earlier studies we have shown clear evidences of improvement of the corrosion resistance of the hard-hard and hardsoft coating systems (Figure 8). These results complement our present analysis. Figure 8: Corrosion resistance test. These results help to understand the wear mechanism as a combination of base and coating. In various industrial applications, selection of base material is always limiting factor as there are limited options available. But by choosing appropriate coating one can easily compensate the limitations of the base material. Multi-layers structure of hard and soft coating combination with hard base is resulted into the best combination. May be such variations can also be possible with various other hard coatings to tailor the surface properties of the industrial components to achieve the required performance level. Above results clearly show that the substrate hardness has direct impact on the coating properties of CrN and M-CrN coatings. Soft stainless steel substrate results in to higher wear rate as compared to the harder surface. Hard Intermediate layer of TiN is used to increase the hardness of the stainless steel substrate. Therefore, by adjusting the substrate hardness, one can tailor the effective wear rate of the system and can be used in the respective industrial applications. The authors would like to thank S.S. and L.S. Patkar-Varde College (Goregaon), Mumbai University, UGC, DST for financial support and Surface Modification Technology Pvt. LTD – Vasai Thane, for having rendered the experimental facilities for the present work. Warcholinski B and Gilewicz A. Tribological properties of CrCN/CrN multilayer coatings. Tribology International. 2014;80:34-40. Feng C, et al. Tribological Behaviors of Titanium Nitride-and Chromium-Nitride-Based Physical Vapor Deposition Coating Systems. Journal of Engineering for Gas Turbines and Power. 2012;134:112504. Ratajski J, et al. Hard coatings for woodworking tools - a review. Journal of Achievements in Materials and Manufacturing Engineering. 2009;37. Kusinski J, et al. Investigation of the life-time of drills covered with the anti-wear Cr(C,N) complex coatings, deposited by means of Arc-PVD technique. Journal of Achievements in Materials and Manufacturing Engineering. 2009;33. Cova CF, et al. Multilayer coatings based on CrN/Cr for molds of plastics. La Metallurgia Italiana - n. 2014;6. John AT. High Rate Thick Film Growth. Ann. Rev. Mater. Sci. 1977;7:239-260.